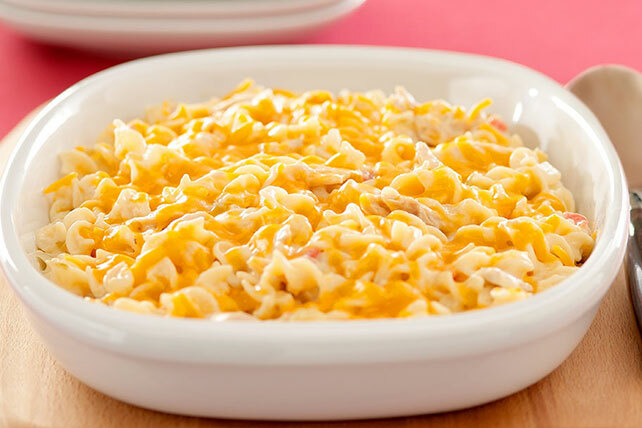 What do you get when you add cheddar cheese to tuna noodle casserole? Comfort food to the max: it's like mac & cheese and tuna noodle casserole all in one. Reserve 1/2 cup cheddar for later use. Melt butter in large saucepan on medium heat. Add onions; cook 5 min. or until crisp-tender, stirring frequently. Add remaining ingredients; mix lightly. Spoon into 1-qt. casserole sprayed with cooking spray. Bake 30 min. or until heated through. Sprinkle with reserved cheddar; bake 5 min. or until melted. Serve with fresh fruit and hot steamed fresh vegetables. Substitute 1 can (6 oz.) salmon, drained and flaked, for the tuna.